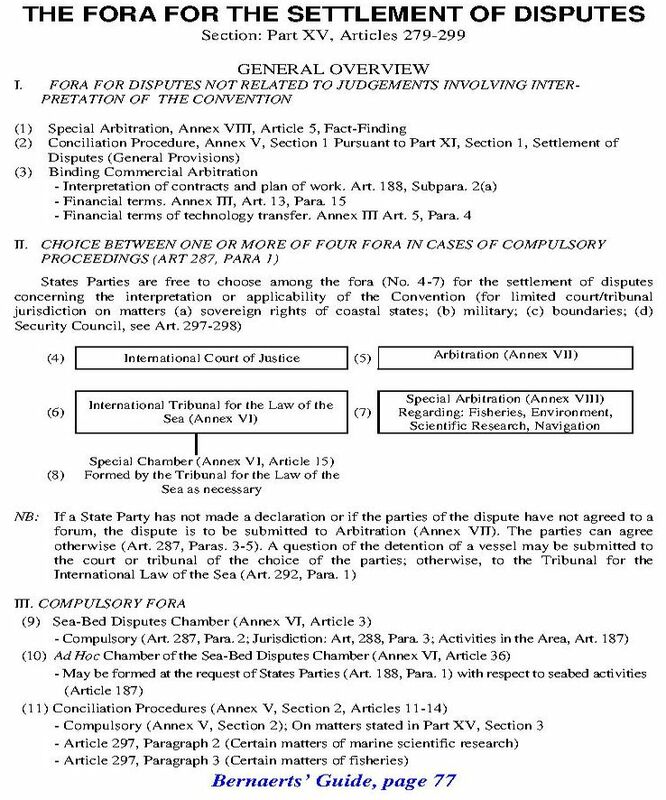 Part XV of the Convention itself includes only provisions for the conduct of the states parties, procedures, and jurisdiction, while the whole structure of the dispute settlement system includes four of the Annexes to the Convention: Conciliation (Annex V), Statue of the International Tribunal for the Law of the Sea (Annex VI), Arbitration (Annex VII), and Special Arbitration (Annex VIII). States Parties must exhaust all local remedies before resort is made to the procedures provided in this section of the Convention. The basic tenent underlying the settlement of disputes is that the parties are bound to use only peaceful means exchange their views without delay behave in accordance with the requirements of the United Nations Charter and seek a solution by negotiation, enquiry, mediation, concili�ation, arbitration, and judicial settlement in good faith. The final effort prior to official proceedings is a non-binding conciliation procedure. But it is necessary that the parties agree to conciliation proceedings and to the procedure to be applied except in cases where conciliation is compulsory such as when a coastal state is required to submit certain marine scientific research disputes and fisheries disputes to non-binding conciliation. - disputes before the United Nations Security Council. For procedural settlement of disputes, the parties may choose among four fora: two courts (the International Court of Justice and the International Tribunal for the Law of the Sea) and two arbitration tribunals. If no declaration to the contrary is in force, the state party is deemed to have accepted arbitration in accordance with Annex VII. Disputes involving release of vessels from detention can be submitted to the Tribunal of the Law of the Sea within ten days from the time of the detention, if the jurisdiction of no other court or tribunal is established. For disputes with respect to interpretation of the Area provisions of Part XI, the jurisdiction of the Sea-Bed Disputes Chamber, a chamber of the International Tribunal of the Law of the Sea is compulsory, unless States Parties request that the dispute be submitted to a special chamber or to an ad hoc chamber. Of some importance for procedure are further provisions covering provisional measures, applicable law, preliminary proceedings, and the finality and binding force of decisions. At all times of the dispute, the guiding principle is that the parties are free to choose any peaceful means of settling their differences.